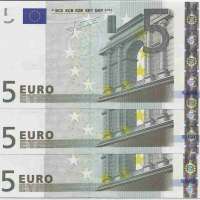 The five euro note (€5) is the lowest value euro banknote and has been used since the introduction of the euro (in its cash form) in 2002. The five euro note is the smallest at 120 by 42 millimetres (4.7 × 1.7 in) with a grey colour scheme. All bank notes depict bridges, arches or doorways in a different historical European style; the five euro note shows the Classical era (up to the fifth century CE). 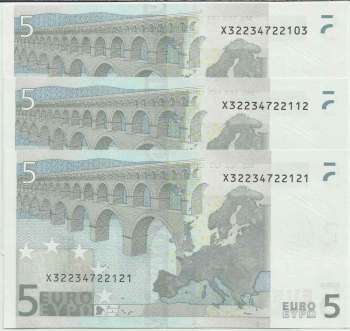 The 5-euro bill depicts a Roman aqueduct strongly resembling the Pont du Gard in Nîmes, France. The Pont du Gard was built about 19 BC to lead water into the town of Nîmes. It employs vocabulary derived in part from the Greek and Roman architecture of classical antiquity, enriched by classicizing architectural practice in Europe since the Renaissance.